Perfectly cooked and piled on a plate, spaghetti, rigatoni or macaroni shells become blank canvases for a plethora of delicious dinners. In order to achieve a pasta masterpiece though, you'll need a reliable go-to source for sauce recipes. Well, here's a lucky "penne" that's sure to do wonders for your weekly pasta routine: The Pasta Sauce Collection. 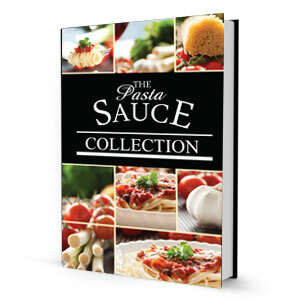 Its pages contain classic recipes for bold red sauces, silky cream sauces, make-it-in-a-pinch quick sauces and traditional pasta sauces that would please any Italian mama. This book also provides tips on choosing ingredients and making the perfect pasta-and-sauce pairings. Learn how to make Chicken Chardonnay or Snow Peas with Peanuts, or discover the best way to stuff mushrooms or prepare a perfectly cooked Rib Roast. Give your pasta the sauce it deserves!